Thank you to Southwest Style Magazine for featuring our work! 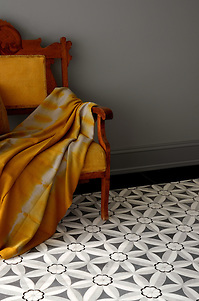 Edie, a stone mosaic shown in Nero, Bardiglio, Thassos and Carrara, is part of the Silk Road Collection by Sara Baldwin for New Ravenna Mosaics. Alcala, a natural stone waterjet mosaic shown in honed Heavenly Cream, polished Carrara, Ming Green, and Thassos, is part of the Miraflores Collection by Paul Schatz for New Ravenna Mosaics. Maharaja, a natural stone waterjet mosaic shown in Lagos Gold and Heavenly Cream, is part of the Silk Road Collection by Sara Baldwin for New Ravenna Mosaics. 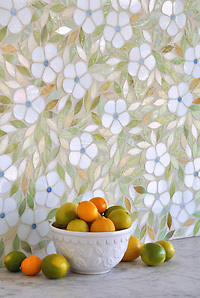 Jacqueline, a jewel glass waterjet mosaic shown in Absolute white, Chalcedony, Peridot, and Quartz/Agate, is part of the Silk Road Collection by Sara Baldwin for New Ravenna Mosaics. 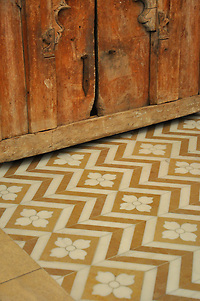 Click here to see more flooring options from New Ravenna Mosaics. To see more of the Silk Road Collection by Sara Baldwin for New Ravenna Mosaics, click here.